MET-Rx Trulean contains a specific blend of key ingredients including Conjugated Linoleic Acid (CLA), Green Tea Extract (GTE) and Acetyl L-Carnitine. When taken as part of a calorie controlled diet, the protein contained within MET-Rx Trulean can contribute to the maintenance of lean muscle mass and the Green Tea contributes to weight loss*. *Green Tea Extract helps to increase fat oxidation and helps to reduce body fat. Protein Blend (Soya Protein Isolate, Whey (Milk) Protein Concentrate (WPC80), Whey (Milk) Protein Isolate), Cocoa Powder, Inulin, Soya Fibre, Acetyl L-Carnitine, Conjugated Linoleic Acid (CLA) (Milk, Wheat, Gluten,Soya), Cegepal Oil (Sunflower Oil, Glucose Syrup Solids (Wheat/Gluten), Milk Protein, Emulsifier (Citric Acid Esters of Mono- and Diglycerides), Antioxidant (Ascorbyl Palmitate, Mixed Tocopherols (Soya), Lecithin, Citric Acid Esters of Mono- and Diglycerides)), Emulsifiers (Soya Lecithin, Acacia Gum), Vanilla Flavouring, Maltodextrin, Sweetener (Sucralose), Green Tea Extract, Bulking Agent (Xanthan Gum), Triacetin, Anti-Caking Agent (Silicon Dioxide). doctor or healthcare professional before use. Discontinue use and consult a doctor if adverse reactions occur. Not intended for use by persons under the age of 18. Keep out of reach of children. Do not use if seal under cap is broken or missing. 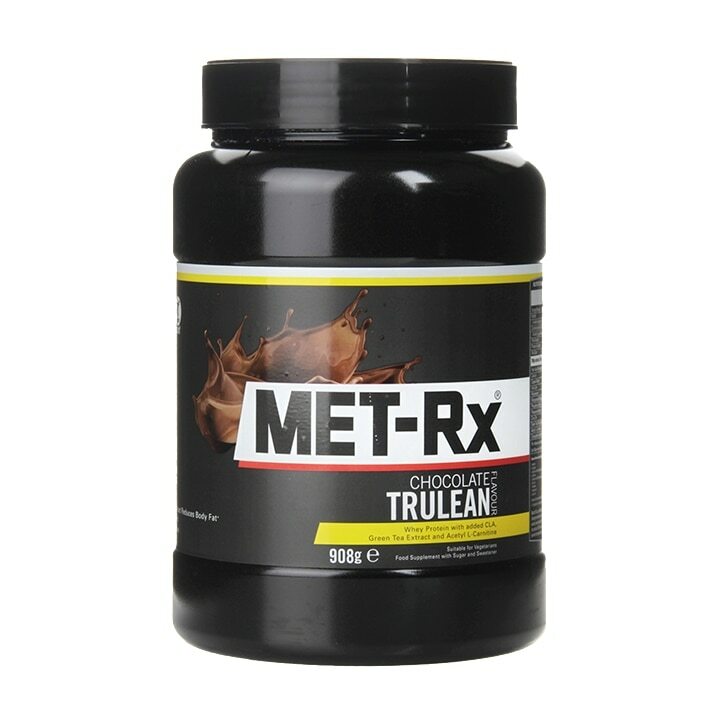 Met-Rx TruLean Diet Chocolate is rated 4.8 out of 5 by 4. Rated 5 out of 5 by Lord VicK from Fast Delivery Very Fast delivery and good price. Among the big variety of products I found the one that fit my diet program the best.